On-duty military personnel have a tough and often dangerous job, so it stands to reason that they should be able to let their guard down every once in a while to blow off a little steam. However, they might want to give folks behind the bar a heads-up when they're planning a big night out en masse. Or they'll at least remember to do so in Iceland from now on after troops visiting Reykjavic recently drank so much beer that they nearly depleted the entire city's sudsy supply. While en route to Sweden and Finland to participate in a NATO military exercise, roughly 6,000 US sailors and Marines made a pit stop in the port of Reykjavic last week and quickly overwhelmed the bars in the relatively small capital city of 122,000 residents. The troops were only there from Wednesday through Sunday, but managed to drink several establishments dry of their beer supply and even forced others to take drastic measures to replenish their stock. Many bars downtown, including the popular restaurant Sæta Svínið and The American Bar, ran out of beer entirely, per Iceland magazine. 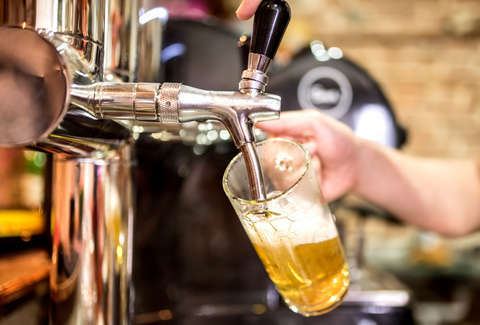 The news site Visir also reports that the local brewery Ölgerð Egils Skallagrímssonar ended up having to send out "emergency supplies" to a number of bars to keep up with the sudden demand for its popular beer. Other establishments begged better-stocked watering holes to let them borrow their booze as they all "were fighting an overwhelming source." Of course, for a Nordic island nation like Iceland that's seen such a huge boom in tourism in recent years, you might expect them to be a bit more prepared to handle that kind of a crowd. Then again, the thirst of a thousand sailors may be well beyond the scope of anything they've ever dealt with before. Kind of makes you wonder how well the supplies of its famously repulsive fermented shark meat held up.